Most of you probably haven't heard the term "accessibility" outside of the context of ramps, elevators, and other means of making facilities usable to people with disabilities. 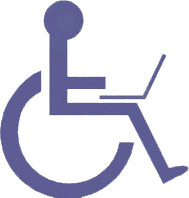 I don't know much about the architectural nuances that go into creating accessibility in the physical world, but I do know a thing or two about building accessible websites and the issues of accessible multimedia. If you're already glossing over and wondering, "Why should I care? I've got 20/20 vision and my mousing hand has never felt better!" slow down for a second. Accessibility on the Web, contrary to Wikipedia's page on the subject, is more than simply pandering to the disabled and their specialized software clients. Designing a website with accessibility in mind makes it more usable for everyone. There's a reason why surfing the web on your cellphone or PDA is still difficult and frustrating at best. Most sites are horribly inaccessible. Those few that are actually easy to use on such devices behave that way because of accessible design. The more accessible a piece of media is, the easier it is for its content to be parsed and digested. The more easily content can be parsed and digested, the more people can actually get at the content. The more people who can get at the content, the better that piece of media is at doing its intended job. Media is a delivery system for content. Accessible media is a stronger, more flexible delivery system than media that lacks accessibility. This goes for anything from a website to a DVD Movie to a newspaper. If you're still having trouble wrapping your head around this whole "accessibility" thing, don't worry. You're not at all alone. Most people don't know, let alone care about it. That's why folks like Joe (keep reading) have so much work to do. Before some passionate designer who doesn't agree with some of this starts posting angry comments, let me make clear that accessibility issues and specs are by no means clear or set in stone. It's more of a continuum and a methodology than a hard technical spec. It's almost an art form still, with heated discussion and argument happening in the relatively small community of designers and developers who care about such things. Nobody has the definitive, final word on this subject yet. Thankfully, it is relatively easy to make textual content accessible these days. Imagery and other visual content is a bit more difficult. Audio and video is almost impossible to make uniformly accessible. This is a huge and complicated problem, with no real solution. Yet. A dude by the name of Joe Clark has decided to take on this problem, and to do what he can to bring accessibility to multimedia. He knows a thing or two about it, having written a book on the subject, and generally being a web accessibility guru. "The Open & Closed Project" as it's being called, has a very wide scope. It won't be cheap to make this happen, and Joe needs some serious funding. In order to eat food and have a roof over his head while getting said serious funding, he needs donations. If you have some spare change, please consider donating to Joe. This guy "knows what's up" when it comes to this issue, and he's selflessly dedicating his professional career (no personal profit here) to making Media better for everyone, including that which lives in our dear sweet World Wide Web. But he can't do it alone. He needs your help. Well, I actually wish there were *more* personal profit. I'm working through a Dreamweaver 8 book right now and there are constant reminders about creating accessible websites.